When you’re invited to the party, or at the latest the day of the party, check with the host(ess) if there is anything that you can bring with you. If the dinner party is quite informal, it’s common for Russian dinner party guests to bring along a dessert. If it’s more formal or the hostess has planned a whole menu, guests will sometimes bring a bottle of something strong. Usually, the hosts are expected to have taken care of the wine (or whatever will be consumed with the meal). Pick up a host(ess) gift regardless, something small like a box of chocolates. A perfect gift for a hostess is a bouquet of flowers, although this is most acceptable if you yourself are a man. Aim to arrive on time, or no more than 30 minutes late, depending (again) on the formality of the dinner party. Dress well — many Russians like to dress up on a regular basis, and a dinner party is no exception. When you enter the house, greet the host(s) correctly — kiss the women on the cheek (twice, starting on the left) and shake the men’s hands. Take off your shoes unless you are explicitly instructed otherwise — most often you will be given slippers to wear inside the house. Offer to help the hostess with preparation. Often the table will be set with appetizers while the host(ess) prepares the main dish. This means you may be able to help with something like chopping, setting the table, and so on. However, most often the hosts will refuse your help before the meal. Be prepared to help afterward though. Hold the knife in your right hand and the fork in the left (Continental style). Don’t start eating until the host invites you to start. Even if it’s a very casual meal where the majority of the food is set out in the middle of the table for you to serve yourself, it’s polite to wait until the host is seated at the table to start eating. It’s customary for men to pour drinks for the women sitting near them. However, it’s ok to refuse a refill. 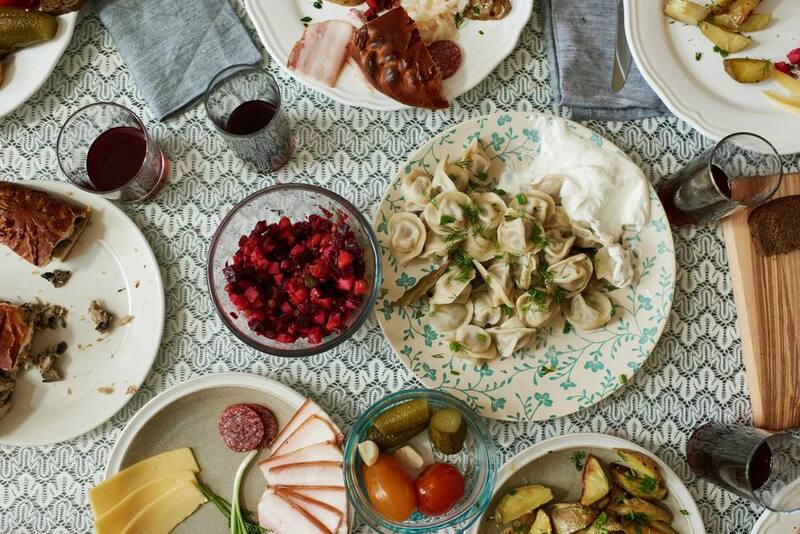 Russian hosts will almost always insist that you eat more. If you want to show that you’re full (and as a gesture of politeness), leave a small amount of food on your plate. Don’t forget that after the main meal, Russians serve tea with dessert! There are usually two rounds of clearing up dishes — after the main course and then after tea (and dessert). Offer the host(ess) help with the cleaning up. He or she will usually refuse out of politeness, but you should insist, giving them the chance to accept your help. If you see that you can help with clearing plates from the table or some other similar task, I’d suggest just doing it without asking — your help will always be appreciated. Thank the host(s) profusely for inviting you into their homes. Don’t forget to give back your slippers!